King was born, with the birth name of Benjamin Earl Nelson, on September 28, 1938, in Henderson, North Carolina, and moved to Harlem, New York, at the age of nine in 1947. King began singing in church choirs, and in high school formed the Four B’s, a doo-wop group that occasionally performed at the Apollo. In 1958, King (still using his birth name) joined a doo-wop group called the Five Crowns. Later that year, the Drifters' manager George Treadwell fired the members of the original Drifters, and replaced them with the members of the Five Crowns. King had a string of R&B hits with the group on Atlantic Records. He co-wrote and sang lead on the first Atlantic hit by the new version of the Drifters, "There Goes My Baby" (1959). He also sang lead on a succession of hits by the team of Doc Pomus and Mort Shuman, including "Save the Last Dance for Me", "This Magic Moment", and "I Count the Tears". 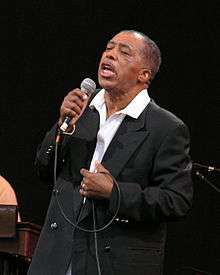 King recorded only thirteen songs with the Drifters—two backing other lead singers and eleven lead vocal performances—including a non-single called "Temptation" (later redone by Drifters vocalist Johnny Moore). The last of the King-led Drifters singles to be released was "Sometimes I Wonder", which was recorded May 19, 1960, but not issued until June 1962. In May 1960, King left the Drifters, assuming the stage name Ben E. King in preparation for a solo career. Remaining with Atlantic Records on its Atco imprint, King scored his first solo hit with the ballad "Spanish Harlem" (1961). His next single, "Stand by Me", written with Jerry Leiber and Mike Stoller, ultimately would be voted as one of the Songs of the Century by the Recording Industry Association of America. King cited singers Brook Benton, Roy Hamilton and Sam Cooke as influences for his vocals of the song. "Stand by Me", "There Goes My Baby", "Spanish Harlem", and "Save the Last Dance for Me" were all named in the Rock and Roll Hall of Fame's 500 Songs that Shaped Rock and Roll; and each of those records has earned a Grammy Hall of Fame Award. King's other well-known songs include "Don't Play That Song (You Lied)", "Amor", "Seven Letters", "How Can I Forget", "On the Horizon", "Young Boy Blues", "First Taste of Love", "Here Comes the Night", "Ecstasy", and "That's When It Hurts". In the summer of 1963, King had a Top 30 hit with "I (Who Have Nothing)", which reached the Top 10 on New York's radio station, WMCA. King's records continued to place well on the Billboard Hot 100 chart until 1965. British pop bands began to dominate the pop music scene, but King still continued to make R&B hits, including "What is Soul?" (1966), "Tears, Tears, Tears" (1967), and "Supernatural Thing" (1975). A 1986 re-issue of "Stand by Me" followed the song's use as the theme song to the movie Stand By Me and re-entered the Billboard Top Ten after a 25-year absence. This reissue also reached Number 1 in the United Kingdom and Ireland for three weeks in February 1987. It was announced on May 1, 2015 that King had died at the Hackensack University Medical Center on April 30, 2015, at the age of 76. His agent said he had suffered from "coronary problems" at the time of his death. King was survived by his wife of 51 years, Betty, three children and six grandchildren. On May 17, two weeks after his death, Imagine Dragons performed "Stand By Me" at the 2015 Billboard Music Awards as a tribute to his memory. King has been covered by acts from several genres. "So Much Love" was recorded by Dusty Springfield and many others. "I (Who Have Nothing)" was performed by Shirley Bassey in 1963 and also by Tom Jones in 1970, as well as a 1979 recording by Sylvester. "Till I Can't Take It Anymore" was revisited by peer Ray Charles in 1970 and "Spanish Harlem" was sung by Aretha Franklin in 1971. "Stand by Me" was covered by Otis Redding, John Lennon and Mickey Gilley. King also inspired several rock bands: Siouxsie and the Banshees recorded "Supernatural Thing" in 1981 and Led Zeppelin did a cover version of "Groovin'", more known under the title of "We're Gonna Groove". ↑ "King, Ben E.". Veromi. Retrieved March 5, 2010. 1 2 3 4 5 Strong, Martin C. (1998). The Great Rock Discography (5th ed.). Edinburgh: Mojo Books. pp. 531–532. ISBN 1-84195-017-3. 1 2 "'Stand By Me' singer Ben E. King dies at age 76". PIX11 News. May 1, 2015. Retrieved May 1, 2015. 1 2 3 4 Grimes, William (May 1, 2015). "Ben E. King, Soulful Singer, Dies at 76; 'Stand by Me' Was One of His Hits". New York Times. Retrieved May 1, 2015. ↑ Jones, Soul (June 1, 2011). "Soul Jones Words: Play It Again, Ben - Ben E. King Interview". Souljoneswords.blogspot.co.uk. Retrieved April 19, 2014. ↑ Goldberg, Marv. "Marv Goldberg's R&B Notebooks: The Later Drifters". Retrieved October 24, 2013. ↑ Fontenot, Robert. "The Life and Times of Ben E. King". About.com. Retrieved May 1, 2015. 1 2 "Ben E King: R&B legend dies at 76". BBC News. May 1, 2015. Retrieved May 1, 2015. ↑ "Experience The Music: One Hit Wonders and the Songs That Shaped Rock and Roll". Rock & Roll Hall of Fame. Retrieved May 1, 2015. ↑ "Ben E. King, 'Stand By Me' Singer and Member of the Drifters, Dies at 76". Variety. May 1, 2015. Retrieved May 1, 2015. ↑ Farber, Jim (May 1, 2015). "Ben E. King, soul legend who sang 'Stand By Me,' dead at 76". The New York Daily News. Retrieved May 1, 2015. ↑ "Ben E. King". Beneking.info. Archived from the original on October 6, 2014. Retrieved April 19, 2014. ↑ "The Drifters Biography". Rock and Roll Hall of Fame. Retrieved May 1, 2015. ↑ "Ben E. King, soul legend and singer of 'Stand By Me,' dead at 76". Associated Press. May 1, 2015. Retrieved May 1, 2015. ↑ "The Sopranos: Peppers & Eggs (Music From the HBO Original Series)". AllMusic. Retrieved May 1, 2015. ↑ "2009 Inductees". North Carolina Music Hall of Fame. Retrieved September 10, 2012. ↑ "Stand By Me Named Towering Song, Ben E. King Towering Performance, Lance Freed Abe Olman Publisher". SongHall. March 27, 2012. Retrieved April 19, 2014. ↑ "The Ben E. King Stand By Me Foundation". Benekingstandbyme.org. August 11, 2011. Retrieved April 19, 2014. ↑ Beckerman, Jim. "Ben E. King can't stop the music", The Record (Bergen County), May 10, 2008. Accessed March 1, 2009. ↑ Wloszczyna, Suan (November 11, 2008). "Comics toast Carlin at Mark Twain ceremony". USA Today. Retrieved May 1, 2015. 1 2 Strang, Fay (May 1, 2015). 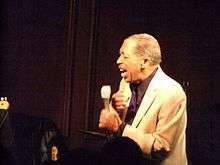 "Ben E King dead: Stand By Me singer dies aged 76". Mirror. Retrieved May 1, 2015. 1 2 Furness, Hannah (May 1, 2015). "Stand By Me singer Ben E King dies at 76". The Daily Telegraph. Retrieved May 1, 2015. ↑ "R&B legend Ben E King dies at 76". BBC. May 1, 2015. Retrieved May 1, 2015. ↑ Bret, David (2014). Brit Girls of the Sixties: Kathy Kirby + Dusty Springfield + Cilla Black + Helen Shapiro + Marianne Faithfull + Sandie Shaw + Lulu. Lulu Press. ↑ Lewis, Dave (2012). From A Whisper to A Scream: The Complete Guide to the Music of Led Zeppelin. Music Sales Group. 1 2 3 4 Roberts, David (2006). British Hit Singles & Albums (19th ed.). London: Guinness World Records Limited. p. 302. ISBN 1-904994-10-5. ↑ Whitburn, Joel (2004). Top R&B/Hip-Hop Singles: 1942-2004. Record Research. p. 173.